MOD Assistants - Get Involved. Make Friends. Enjoy Motherhood. 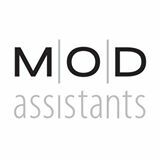 At MOD Assistants we provide our clients with the ease of mind that only a completed check list of tasks can provide. Our team of qualified, reliable (and overly organized) personal and business assistants work with each client from 4-16 hours per week handling laundry, pet care, household management, office maintenance, scheduling and mundane errands. Our goal each and every day is to give our clients #moretimetolive. See how much time MOD Assistants can save you with a month of service. Purchase 3 weeks and receive your 4th week free! *minimum 4 hours per week. Free week will reflect the hours used during previous 3 weeks.